Yesterday’s giveaway winner is Patrik! Please reply back to my email to claim your prize! 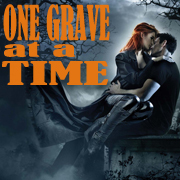 I just entered to win a SIGNED COPY OF ONE GRAVE AT A TIME from @frostfans! Enter here: http://www.frostfans.com/?p=3009 #giveaway PLS RT! You must leave a comment on this post with a link to your tweet or Facebook share for your entry to count! Please use valid contact information so we may contact you should you win. Today’s giveaway ends at 4:59 p.m. PST on September 27th, 2011. Awesome giveaway of an AWESOME book! so I tweeted and FB’ed it! I posted to Facebook… but could not get a good link to leave here… so posted again to Twitter…!! So hopefully I will be twice as lucky. Tweeted: http://twitter.com/#!/Northwomn/status/118776464744259584 And I finally figured out how to link to just one tweet. Yay! I hope I did this right! And that I’m not too late. OMG< love the whole series. I love Cat and Bones! FB'd as status as requested. I tweeted! I’can’t wait for the discussion. Would love a copy of OGAAT. Hopefully this is a lucky comment!